This past weekend, America's most popular sketch comedy TV show combined the very best of our childhood memories with a certain political figure who was thrust into the limelight during 2016. 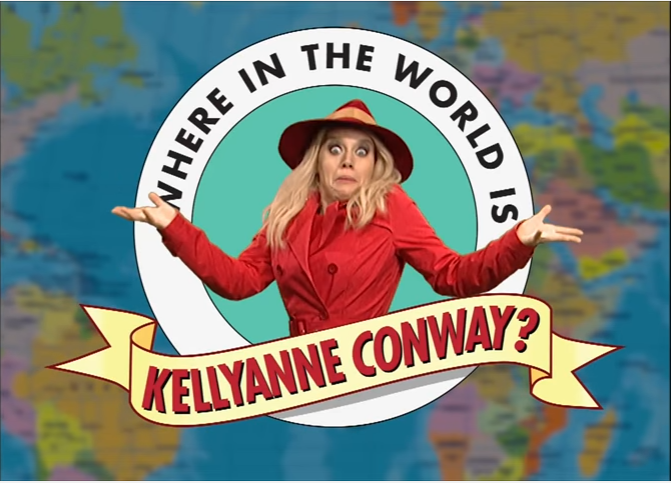 In a parody on the 1990s children's game show "Where In The World Is Carmen Sandiego," Saturday Night Live pokes fun at the current counselor to President Trump, Kellyanne Conway. The sketch is hilariously titled "Where In The World Is Kellyanne Conway?" What's most hilarious about the bit, outside of the final response by the kid competitors is the featured a cappella group who sing the theme song throughout the segment, which is a nod to Rockappella, the group who originally recorded the theme song for the 90s hit show.